432 Shore Road in Gilbert, SC is near Lake Murray,SC in Lexington County. This rare find is 8 miles west of Lexington, SC; less than 20 miles from Columbia Metropolitan Airport and two hours away from Charlotte Douglas International Airport; 23 miles from downtown Columbia, the capital of South Carolina; 28 miles from Williams Brice Stadium and home of the University of South Carolina Gamecocks; 28 miles from Newberry Opera House; and 42 miles from historic Aiken, SC. The property is zoned for Gilbert Elementary, Middle and High Schools which are within the award-winning Lexington One school district. This immaculate 2800 SF, 4 bedroom, 3.5 bath home sits on 1.07 acres. There is NO homeowners’ association fee! The brick front and vinyl siding, soffits and fascia make this home virtually maintenance free. The front door is flanked by sidelights with mini plantation shutters and an arched transom. Living room, dining room and halls boast gleaming hardwoods. The entire house is painted in a neutral color with white trim and moldings. The formal dining room is to the left of the foyer and delineated by a Roman Doric column. The dining room has a palladium window and raised panel chair rail. The living room has double box ceiling, recessed lights, wiring for surround sound and brackets in place, plantation shutters and a fireplace which could be equipped with gas logs supplied with natural gas from South Carolina Electric and Gas. To the right of the living room is an angular hall where there is a linen closet and large coat closet. Two bedrooms have Jack and Jill bath with large vanity. The kitchen has neutral colored solid surface counter tops, new glass tile backsplash, recessed lights, under cabinet lighting with light and tilt control, a bar, and large eat-in area with beautiful bay window overlooking the back yard. All kitchen appliances are stainless steel and were purchased in 2016. They convey with the sale: Whirlpool WRX735SDBM 36” 4-door French door refrigerator which features an external refrigerated drawer and accu-chill temperature management system; Kenmore 5-burner gas range; Whirlpool dishwasher; Whirlpool convection microwave; new disposal. To the left of the split floor plan is the master suite with double box/high ceilings, wiring for surround sound, walk-in closet, private bath with garden tub, separate shower and separate water closet, recessed lights and double vanity. There’s a large half bath, large hall closet which could double as a pantry, and laundry room with oversized vanity and utility sink, built-in cabinets, shelves and rod for hanging clothes. GE washer and dryer convey. The finished room over the garage (FROG) is the 4th bedroom with dual control HVAC. Upstairs there is a full bath with tub/shower and pedestal sink and a large closet. There is attic storage off the FROG, as well as, a walk-in/wrap-around/floored attic. All bedrooms have ceiling fans. All closets have wood, not wire, shelving. All bathrooms have tile floors and tall, elongated toilets. There are high ceilings throughout the main level. Off the living room is a screened porch with vaulted ceiling and ceiling fan. Both the front door and door from the living room to the porch have new screen doors, perfect for enjoying the fresh air. The two car garage is fully finished, plumbed for a utility sink, has a side, service-entry door and lots of built-in cabinets and shelving that convey. There are only two steps from the garage into the house. The current owners added gutters to the home. They also added a retaining wall in the back and extensive concrete to create an oversized driveway on the right side of the house which leads to a “no expense spared” 32 x 60 garage with 12 ft ceiling and 11 ft garage door. This building is insulated, wired for cable and has pull down attic access. The entire yard is equipped with an irrigation system. There is also a 12 x 16 storage building. From 432 Shore Rd, one can be in the mountains of NC or on the beaches of SC in less than three hours. Price’s BBQ is a 5 minute walk away. Lowe’s Food Store, Bi-Lo and Publix are 10 minutes away. Larry Koon Landing, which provides free access to Lake Murray, is less than 3 miles down Shore Road, just past the bridge to Shull Island. The landing has picnic tables, restrooms operated seasonally, ramp and dock. Lake Murray is considered the jewel of South Carolina. It is an approximately 50,000 acre lake where visitors and residents enjoy a variety of water sports including boating, swimming and fishing. Lake Murray is best known for its largemouth bass and striped bass, but other popular game fish include bluegill, redear sunfish, crappie and catfish. Mid-Carolina Electric Cooperative provides electricity; South Carolina Electric and Gas provides gas; Spectrum is the cable provider; Danny Kneece services the HVAC; and the Town of Lexington provides water and sewer. Termite bond was renewed in 2016 and is transferable to buyer. This amazing, move-in ready home at 432 Shore Road, Gilbert, SC 29054 offers an amazing opportunity. No covenants and restrictions; no HOA; move-in ready; all appliances convey; 1 year home warranty included; carpets to be professionally cleaned (per service agreement) prior to closing; split ranch with FROG and full bath upstairs; 1+ acre level lot; decked out man cave/garage; low maintenance exterior; close to Lake Murray; convenient location; much, much more! Inventory is low; this one won’t last long. 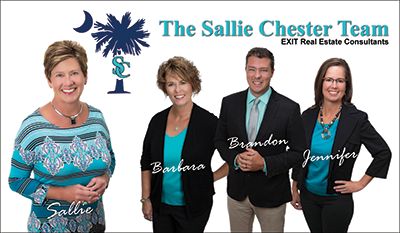 Lake Murray SC Real Estate - The Sallie Chester Team of Exit Real Estate Consultants​. With an emphasis on property sales, Sallie Chester and her team of professional REALTORS® specialize in residential real estate in Lexington South Carolina and surrounding areas. Utilizing cutting edge technology, along with old-fashioned customer care, The Sallie Chester Team takes pride in providing each client with superior service. Contact us today at 803-707-8595.